As an Engineering Peer Educator you’ll gain valuable experience while helping new engineering students succeed in transitioning to college. Engineering Peer Educators (EPEs) are current engineering students who work with the Engineering Advising staff to develop curriculum and activities for the GEN ST 199: University Community component of Engineering First Year Interest Groups (E-FIGs). All incoming Engineering Undeclared students take this class in fall quarter of their first year at the University of Washington. The GEN ST 199 class is facilitated entirely by you, our peer educators. Through this experience you not only have the opportunity to help incoming Engineering Undeclared students succeed in their transition to college, but you also earn course credit and a scholarship while enhancing leadership skills that will assist you in your future professional endeavors. Questions? Contact us at engradv@uw.edu. At the 2018 end-of-year EPE celebration: Sam Najmolhoda, Lead Engineering Peer Educator; Lauren Fryhle, Lead Academic Adviser; and Alejandro Diaz, EPE and winner of the 2018 Outstanding Engineering Peer Educator Award. The autumn-quarter GEN ST 199: University Community classes are composed of groups of 15 to 25 new UW first-year Engineering Undeclared students. These classes are linked to ENGR 101 — a large, lecture style course designed to introduce students to the different disciplines offered within the College of Engineering. Your role as an experienced engineering undergraduate student is to serve as a teacher and mentor. The purpose of the GEN ST 199 seminar is to help students understand what the College of Engineering expects of them, to help students understand what they can expect of the College of Engineering, and to take active steps toward maximizing their educational experience. Classes are structured around topics such as major exploration, educational planning, campus resources, academic success strategies, student clubs/competition groups, etc. EPEs collaborate with each other to plan activities that help achieve the GEN ST 199 learning outcomes and support new Engineering Undeclared students as they develop confidence in navigating the UW and Seattle. Welcome new Engineering Undeclared students to UW. Answer students’ questions about UW and the College of Engineering. Share personal experience as an engineering student; support students’ exploration of engineering majors. Support new students’ adjustment to UW; help them feel connected to the College of Engineering community. Help connect students to university resources. Prepare for GEN ST 199 class meetings. Make adjustments to the GEN ST 199 curriculum guide to reflect your teaching style. Lead meaningful discussions and activities (for example, that help students make meaning out of ENGR 101 content). Teach new students to utilize academic planning resources such as the engineering department requirement sheets and MyPlan. Record students’ completed assignments and grades using Canvas. Provide thoughtful feedback on students’ assignments. Track students’ class attendance in Canvas. Meet weekly with other EPEs and Engineering Advising staff in spring and fall quarters. Communicate frequently with the Lead EPE and Engineering Advising staff about any student issues or class concerns. Actively engage in all EPE training and meetings. Contribute to the GEN ST 199 curriculum by providing ideas, feedback, and suggestions in weekly EPE meetings (spring & autumn). Build relationships with fellow EPEs. Utilize fellow EPEs as resources. Build relationships with people who may be similar to or different from them. Communicate effectively through a variety of modes (email, phone, public speaking). Develop a greater sense of confidence in their roles as leaders on campus. Support new students in their transition to the UW College of Engineering community. Create an engaging class experience that contributes to Engineering Undeclared students’ achievement of the GEN ST 199 learning outcomes. Value an intentional exploration and discernment process. Attendance at all Engineering Peer Educator meetings, trainings, and GEN ST 199 classes is mandatory. Dates are subject to change. Attend EPE orientation: likely Thursday, March 7, 5–7 p.m.
Take ENGR 498 Student Leadership Development: First Year Transitions. In this class, you will receive training in first year transition theory, public speaking, discussion facilitation, lesson plan development, and leadership. Note: Your schedule must accommodate the class times to be able to participate in the program. TBD: Participate in engineering new student advising and orientation. Teach a section of GEN ST 199. EPEs are responsible for preparing each class session (the curricular framework is provided by the EPE program, but each EPE must prepare personalized lesson plans building on that framework. Much of this will be done during ENGR 498 in spring quarter). Attend ENGR 498 once a week with all EPEs during autumn quarter in addition to teaching GEN ST 199. Make contact (in person, phone/text, or email) with each of your students at least once. Participate in at least one recruitment activity (tabling or info session) in January. Started at UW as a freshman and are enrolled as an undergraduate in the College of Engineering at UW Seattle with an expected graduation date of June 2020 or later. Passion for helping new students get integrated into the UW College of Engineering community; enthusiasm about the value of the Engineering FIG experience. Strong organizational and time management skills; demonstrated ability to balance a variety of activities, including academics and extracurricular activities. Demonstrated involvement on campus or in the community. Strong interpersonal communication skills: ability to work well with peers, new students, staff; ability to listen and respond to individuals' questions and concerns; ability to help others problem-solve and make decisions. Collaboration skills: be willing and motivated to develop/personalize the GEN ST 199 lesson plans with other EPEs. Public speaking ability: be comfortable presenting in front of audiences of 20–25 people and facilitating discussions. Commitment: fulfill all responsibilities as an EPE throughout the spring, summer, and autumn quarters of 2019, and maintain contact with Engineering Undeclared cohort during winter and spring 2020. Good academic standing: have strong academic record. 1-3 variable credit hours spring 2019 and autumn 2019. Spring: ENGR 498 credit for Student Leadership Development: First Year Transitions class. Autumn: ENGR 498 credit for continued weekly training and teaching the discussion section of GEN ST 199. 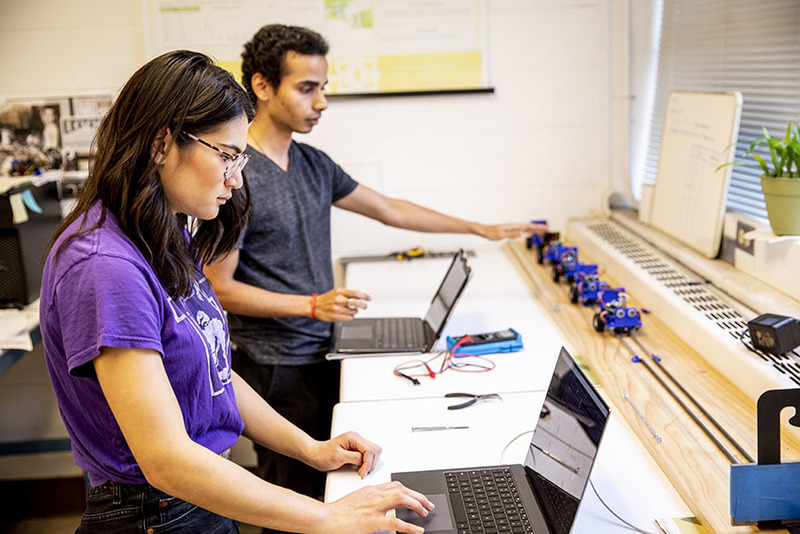 Application due: January 27, 2019 by 11:59 p.m.
As an Engineering Peer Educator (EPE) and CoE Student Advisory Council (COESAC) member, Karli Berger has already made an impact on the lives and educations of UW Engineering students. In an interview during her senior year, she shared what has driven her to study mechanical engineering, what's fascinating about her research, and how all this fit in with her time on the UW Cheer team.